Lauren Conrad offers contemporary fashions for the modern woman that include her LC designs, a Runway collection, maternity looks, accessories and more. For those who like a touch of vintage style, her Paper Crown line might have just what you're looking for. Fashion designer, author, and television personality Lauren Conrad created the LC Lauren Conrad line for today's stylish woman. The collection delivers modern silhouettes with soft details to pull off a casual yet chic look effortlessly. The collection is exclusively available at Kohl's online and in local stores. It includes clothing, shoes, accessories, and cozy home decor for fashion enthusiasts. LC Lauren Conrad Pull-On Jeggings: These midrise jeggings look sleek and polished without losing the comfort of wearing leggings. The pants feature an elastic waistband, two back pockets and two fake ones, and stretchy denim construction. They come in five pretty colors such as black, rose taupe, forest green, port royale and destructed light. According to reviews, the destructed light jeggings are cropped at the hem, but the rest of the colors are full-length pants. The pull-on jeggings are under $50, and available in sizes 2-18, but also sizes 2-18 for petite and taller ladies. Plus Size Lace-Up Crewneck Sweater: This crewneck sweater comes in two cute designs: the light gray top has printed hearts while the other one comes in a darker gray and just says the word "Love" in the front in a handwritten font. The sweater's high-low hem style offers enough back coverage while the long sleeves keep you warm in colder temperatures. This top is priced around $40, and the sizes range from 0X-2X. Love, Lauren Shirred Peasant Top: This long-sleeved top comes with beautiful feminine details such as pintucks at the sleeves and a shirred square neck. It's available in eight patterns, including flowers and hearts, and two color options: cream tan and Windsor wine. This peasant top is priced around $30, and its sizes range from XS-XXL. 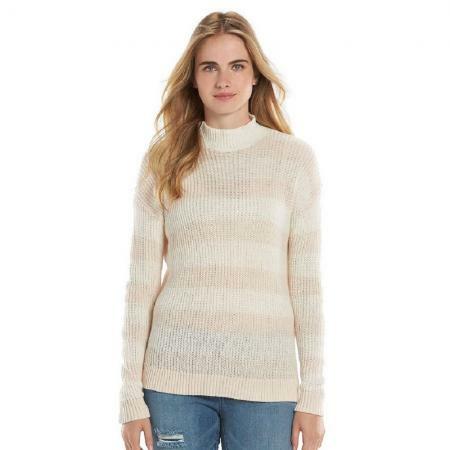 Striped Mockneck Sweater: This lovely sweater, made of a cotton/acrylic blend, is not only cozy but also has a flattering drop shoulder design and muted color. Its simple ribbed design goes perfectly with jeans. Find it in small for about $54. The brand's Runway collection focuses on clothing and accessories better suited for evening and special occasions. You'll see in this section classic styles upgraded with trendy details. For example, pleated midi skirts in a metallic finish, velvet dresses, and cold-shoulder tops. The sizes range from XS up to XL. Although this is the Runway version, the prices for both the clothes and accessories are still under $100. Print Flutter Top: The print flutter top is a gorgeous piece of clothing for a casual yet pretty look. The top has a fairy-tale type dreamy print paired with vibrant colors. It features three-quarter flutter sleeves with a delicate construction. The back is slit open, so you might need to wear something underneath in case you're uncomfortable with showing off skin. The top retails for around $30, and it comes in sizes X-Small and Small. It's available in two prints: Dauphine and Unicorn Garden. Moto Jacket: This moto jacket is one of the best outerwear pieces in the LC Runway collection. The jacket comes in two colors, Evening Blue and Valentino, with rose-gold details which make it look more fashionable. It retails for under $60, but the adjustable size buckles and asymmetrical zip front make it worth buying. According to reviews, the blue version might be more of a royal blue shade, and sizing issues have been reported, so it's recommended to order one size up. High-Neck Ruffle Tank: The high-necked tank has a pretty appeal, with the ruffles adding a special touch to this casual but captivating top. It retails for around $20, and the sizes range from XS to L. Keep in mind that the tank is made of 100 percent polyester, which can be hard to wash and isn't environmentally friendly. Popover Maxi Dress: This fun, flirty style is available in Laurel Green, Porcelain Rose, or Black Tie for just under $25. It comes in sizes small through large and has a pretty v-neck front and drawstring racer back. The long length makes it versatile enough to wear for casual day or evening events. Lauren Conrad also has a mini line of maternity clothing featuring tops, pants, and dresses in a variety of colors and cute prints. The maternity clothes are under $50, and the sizes range from XS to XXL. Maternity Floral Fit & Flare Dress: This adorable green dress comes in a floral print and features a figure-flattering empire waistband. According to reviews, the dress fits true to size with the help of the back zip closure. Sizes range from XS to XXL, and the dress is priced under $35. Maternity Full-Belly Panel Jeggings: These chic jeggings come with an elastic full belly panel to give you comfortable support throughout your pregnancy. Priced around $40, these maternity pants are available in ivory, green, mauve, and burgundy. They have a slim fit but a stretchy denim construction. Sizes range from 2-18 but also sizes 2-18 for petite and taller women. Maternity LC Lauren Conrad Babydoll Tee: This crewneck tee has a peplum style hem that flatters your belly, short sleeves, and a pocket at the bust. The back has a keyhole detail adorned with a bow. According to reviews, the top is a little longer than regular t-shirts but not as long as a tunic, so it goes well with maternity skinny jeans. This babydoll tee is priced around $25, and available in sizes S-XXL. It comes in two prints, a pink floral design and a striped print in lilac. The accessories line features hats, scarves, handbags, shoes, jewelry, and sunglasses for under $100 each. Besides the usual products, other feminine details like hair accessories and pom-pom key chains are also part of the collection. For the home, the bedding line carries duvet covers, sheets, comforters, and quilts. The bedding is available either as a set or separate pieces in sizes twin up to California King. For the bathroom, the collection includes bath accessories, rugs, towels, and shower curtains. The home collection comes in pretty pastel colors, metallic accents, and beautiful patterns such as polka dots and flowers. Paper Crown was launched in 2010 by Lauren Conrad & Maura McManus as a collection of vintage-inspired designs with a contemporary edge. The fashion line includes romantic dresses, feminine blouses, chic day wear, and tailored basics, all designed by Conrad. In 2014, a bridesmaids' line was added to the brand that offers dresses to fit various body types, and that can be worn again. Mitzi Dress: This little black dress features a high neck and a lovely tiered design at the skirt of the dress. It's perfect for a date or for work if you add tights and pumps. The dress is priced around $250 with sizes ranging from XS-L, and it's available in black only. Lisa Jumpsuit: Done in a beautiful cream color with a black waist-tie accent, this feminine jumpsuit features a v-neck top with ruffles and wide-leg pants that go just above the ankles. It's simple and elegant, and can be worn for a variety of occasions. Pair with strappy cream colored heels for an effortless spring or summer style. It comes in sizes 0-10 for just under $270. Britton Dress: This two-tiered dress is from the bridesmaids' line, but it can be used for other occasions. It's fully lined, and it comes with an elastic waist. The Britton dress is priced around $275, and available in sizes XXS-XXL. It's made in a variety of colors such as cream, silver, black, navy, light blue, burgundy and a dusty rose shade. Style it with strappy heels and an embellished clutch for a garden wedding. Women's Savannah Dress: Simple yet elegant, this sophisticated sheath style dress comes in white and is made of 100 percent silk. The slight dip in the back makes it alluring without being over the top. Find it in sizes 0-2 for under $75. The LC Lauren Conrad is a go-to option for the essentials and trendy pieces, while the Runway and Paper Crown designs offer great choices for your special occasions. Check out the fashions for must-have styles from casual chic to glamorous looks.